Yes, I paid little heed to the religious feast, concentrating instead on the chocolate feast which occasionally materialised depending on what relations came to visit that Easter Sunday. I still fondly remember some of those moulded chocolate eggs and their candy contents that I had to reluctantly share with my siblings. Before Easter eggs became a confectionary product they were traditionally painted chicken eggs, allegedly hidden in gardens by the Easter Bunny, for good boys and girls to find on Easter morning. I often jokingly wondered what became of the Easter eggs that remained undiscovered in the long grass of the garden, would the bunny come back for them? Well if he didn’t, it could only be good for the garden. You see eggs or to be more specific eggshells are of great benefit to your garden. Don’t bin them or let them go to waste, instead put them to work. Here’s the top three uses for eggshells in your garden. 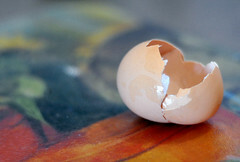 The humble eggshell, a source of calcium for plants, photo / pic / image. (1) As a soil amendment. Grow Tomatoes? Well an addition of extra calcium to their soil/compost will help prevent blossom end rot. Our eggshell is approximately 95% calcium carbonate, the active ingredient in garden/agricultural lime. As well as providing a source of calcium for plants, calcium carbonate will also increase the pH of acidic soil making it more conducive to growing certain vegetables such as cabbages or beans. There is about 1% nitrogen in eggshells, which will benefit your plants requiring leaf promotion. The way to go about harnessing this is to firstly remove the membrane from inside the shell of raw eggs (no need on boiled ones), wash them out well with warm water, and then leave them to air dry. When dry to the touch, put them into a see-through plastic bag and seal it. Now it is time to make dust out of the shells with your crushing tool of choice, a few runs with the rolling pin being particularly effective for this. Once your shells are reduced to pieces as small as grains of salt, then the resultant amendment is ready for working into you soil or sprinkling over your compost heap. 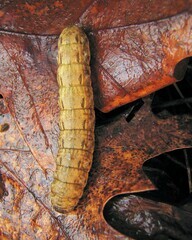 Help cut out cutworms with your eggshells, photo / pic / image. Eggshells can also be used to naturally assist you prevent pest attack in the garden. Crushed shells spread in a circle around plants susceptible to slug, snail and cutworm attack (most veg, annuals, and soft perennials), will make life very difficult for these pests. As they begin their crawl towards your juicy plant, their underbellies will firstly be cut by the sharp shells, continuing further they will begin to dehydrate, and before you know it morning has arrived, allowing your garden birds to pick them off. When crushing your shells for this purpose, go a bit easier on them, leaving the particle sizes bigger and the edges hopefully sharper. A smaller rolling pin required perhaps. If you want to prevent cabbage-white butterflies laying their eggs on any of your brassica-family vegetables (cabbage, cauliflowers etc), then you can also use eggshells as well. No crushing this time, just wash them out well and make two complete pieces out of every halved eggshell. Scatter these white-side up through your brassica-family vegetables soil. Spotting the white shells, the arriving butterflies think another cabbage butterfly is there already, so they decide not to lay their eggs, preferring instead a less competitive patch. No eggs laid means no hungry caterpillars to ravage your crop, and that’s a relief. Egg on your plants with some previously boiled water, photo / pic / image. (3) As a liquid feed. Do you or your family eat boiled eggs? Well, if you do, the water you boil your eggs in will acquire some of their shells calcium and other helpful minerals. Once this water has cooled it can quite easily be used as a liquid feed for your houseplants, simple and effective. “Go to work on an egg” was an advertising slogan used by the United Kingdom’s Egg Marketing Board during the 1950s. Further reading: Irish garden pests, problems with slugs and snails. This entry was posted on Friday, April 10th, 2009 at 5:18 am	and is filed under Vegetable garden tips and advice.. You can follow any responses to this entry through the RSS 2.0 feed. You can leave a response, or trackback from your own site. Great articles. Very helpful. I’m printing them and putting them in a binder - I’ve got a bad memory! I’ve got a 3′ deck and had decided to put my hand to growing more vegetables there this year. I only grew tomatoes last year. Your articles are very timely for me. Glad you liked the piece Mary. A 30 ft deck should give you loads of room for veggie growing. after we finish grilling our breakfast (healthier)! we turn off the grill and use the rest of the heat to dry the eggshells. Then crush the eggshells with your hands and throw them in a kitchen grinder. Out comes the finest powder you have ever seen. Wet the plant roots and dip them in the powder before planting. This will give the plant healthier roots and as a result better plants.